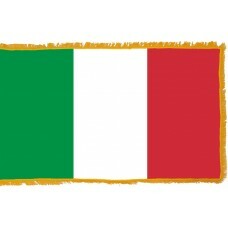 The Italian Flag is comprised of three vertical bands in the colors green, white, and red. There are varied interpretations on the meaning of the colors, howevver the most common interpretation is that the green color symbolizes the hills, plains, and greenery of Italy as well hope and prosperity, the white color symbolizes the snowy Alp mountains, as well as faith and peace, and the red color represents the war fought for independence and the bloodshed as well as charity and giving. 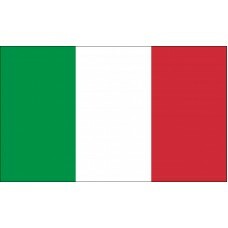 The colors on the flag were first used by the Italian military in 1796, but the flag comprised of these colors was not officially adopted until January 1st, 1948, although it was used unofficially since June 1946. It is thought that the Italian flag was inspired by the French flag after Napoleon brought it into Italy in 1797. Italy has a rich history spanning back 200,000 years. The country has spent many years under the rule of different countries (mainly Austria, France, and Spain). In 1494, France invaded and attacked Italy causing the collapse of many states. In 1527, Germany and Spain both invaded Rome and from 1713-1795, Italy was dominated by Habsburg Austria. In 1796, when Napoleon entered the country, Italy and all the states were briefly united until the Napoleonic war in 1814. Following the war, and the Congress of Vienna, Italy once again became divided into 8 parts. Parma, Moderna, and Tuscany were ruled by the Habsburgs, Lombardy and Venetia were ruled by Austria, Piedmont-Sardinia-Genoa and Papal States were independent and Naples and Sicily were ruled by France. In 1848, the "Risorgiment" began. The Risorgiment which literally translates as "Resurgence" was Italy's movement for independence and the attempt to unite the separated states. There were many battles in Italy during this movement, with the main and most powerful opposition coming from the Austrian Empire and the Habsburgs. In 1861, the Kingdom of Italy was created by Giuseppe Garibaldi who took control of Sicily and from here, the many states started to become united. Italy is located in Southern Europe and shares borders with Austria, France, Switzerland, Slovenia, The Vatican City, and San Marino. The capital of Italy is Rome. Italy is home to two independent states, which are, San Marino and the Vatican City (the smallest country in the world). Italy is the 5th most visited country in Europe as it is home to such beautiful and historical sites like the "Colosseum" (located in Rome) which is the largest amphitheater that was built during the Roman Empire and is one of the most popular tourist attractions in Italy. Other popular attractions include, the Leaning Tower of Pisa, Lake Como, the Cathedral of Santa Maria Del Fiore (Duomo Santa Maria del Fiore) in Florence, Venice, and a trip on the Gondolas.